Biff Sauce - the heart and soul of a classic Biff-Burger! Do you remember the good old days when you ate a burger from Biff-Burger with that wonderful sauce, in which the burger was dipped into immediately after it was broiled in the Roto-Broiler? According to the National Biff-Burger System Franchise Opportunity Information, a large patty of 100% pure Western ground beef, was broiled in the "Roto-Red Broiler", then dipped in a special, tangy sauce made of 27 spices and served on a bun toasted to a golden brown in the same infra-red broiler. NOW, you can enjoy and savor this old-time favorite sauce ! The sauce can be purchased directly from the Beef Burger Drive-In, located at 1040 West Lee Street, or from Bessemer Curb Market, located at 932 East Bessemer Avenue, both in Greensboro, North Carolina. Of course, you could always make either the Biff-Burger or the Kenney's version yourself at home by following the recipe links below! Ralph Havis, the owner of Beef Burger, located at 1040 West Lee Street in Greensboro North Carolina, states that his dipping sauce is made from the original recipe obtained from the former owner of the restaurant, when it was officially known as Biff-Burger and still referred as by locals. This is as close to the "real deal" that you can get to the original Biff-Burger sauce!! 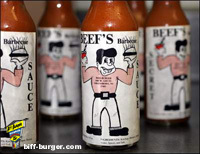 The sauce was originally packaged and labeled as "Beef's Barbeque Secret Sauce" at first but has now been re-labelled as "Beef's Barbeque Special Sauce". Currently, you can purchase 5 oz. bottles of Ralph's sauce, "Beef's Barbeque Special Sauce", at the Beef Burger located on Lee Street or the Bessemer Curb Market located at the Summit Shopping Center, 932 East Bessemer Avenue, Greensboro. Another version of the Biff-Burger sauce, which may be slightly different but similar, is the Kenney's Sauce and is currently available via through different venues! 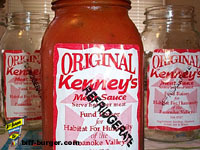 Originally, the sauce was called "Original Kenney's Meat Sauce", pictured above, and was prepared in an institutional style kitchen in large batches by William Kenney himself, the former owner of many Biff-Burger locations in Virginia and later founder of Kenney's. The jars of sauce were sold immediately to the public at fund raising events for Habitat for Humanity with all proceeds going to Bill's favorite charity. However, at that time, refrigeration was needed shortly after preparation and selling of the product, so the sauce could not be shipped or distributed outside of the immediate Roanoke area. Due to the increasing customer demand for the sauce and the short shelf life of the original version, Kenney's Sauce was then manufactured in a government approved cannery under approved guidelines, including health and cleanliness inspections, under a new name, "Mr. Kenney's Mild Barbeque Sauce". The product had a shelf life of up to one year under refrigeration. With this improved manufacturing process, the sauce was easily bottled, distributed, and sold to various retailers throughout the Roanoke Area and the Shenandoah Valley regions of Virginia. The sauce became more readily available through the various local Kroger grocery stores, Habitat for Humanity, and even reports of Wal-Mart Supercenters along the I-81 corridor. Sadly in early 2012, after several years of production, the Virginia Beach processing facility that formerly made Kenney's Mild Barbeque Sauce stopped producing the product. Consequently, the sauce disappeared from the market for a few years and was no longer available through the former Habitat for Humanity and Kroger grocery store venues. Today, production of the Kenney's Sauce is once again being made through a new processing facility (kitchen). The same sauce that was formally used on Kenney's famous "Sauce Burgers, can once again be purchased through various venues. The 16 oz. bottle of Kenney's Original Recipe Sauce can also be purchased at participating Kroger grocery stores throughout the Shenandoah Valley of Virginia and the greater Winston-Salem metropolitan area of North Carolina. The sauce can also be purchased online directly through ShopFoodEx.com, an online company based in Roanoke, Virginia that specializes in delivering groceries to your door. Other venus in which the sauce is available from is listed "here". The sauce can also be purchased directly from Habitat for Humanity in the Roanoke Valley (HFHRV). All sales directly support the Habitat for Humanity! Please help support this great cause and purchase all that you can! Habitat for Humanity in the Roanoke Valley, Inc. Instead of buying it, why not try making it yourself! A dedicated viewer, and former Biff-Burger Drive-In employee, offered this version of the sauce that her restaurant used in Florida. So without delay, click on either button below, print it, and try it out in your own kitchen! Let me know what you think. Here is a version of the sauce from a Kenney's fan (taken from the internet) that is similar to the sauce that Kenney put on their broiled burgers. Considering that each Biff-Burger Drive-In location was individually owned and operated independently from each other after the National Biff-Burger System went out of business in 1976, many remaining Biff-Burger locations changed the names of their burgers (such as "Deluxe" and "Super") to reflect changing times with other fast food competitors and may have used variations of the special sauce as well. If you have previously worked at a former Biff-Burger Drive-In and/or just wish to drop us a line, we would love to hear from you!